THURSDAY, March 16, 2017 (HealthDay News) -- Underscoring the link between brain development and touch, new research suggests premature babies face a disadvantage compared to their full-term peers in their brain's sensitivity to gentle touch. Analyzing 125 preterm and full-term infants, scientists also found that preemies experienced lowered brain response to gentle touch in the aftermath of painful medical procedures. "We all know in our daily lives how important touch is, but for babies ... it's also a scaffold to building their brains," said study author Dr. Nathalie Maitre. She's director of the NICU follow-up clinic at Nationwide Children's Hospital in Columbus, Ohio. "Pain and touch don't go through the same nerves," Maitre added. "We didn't expect how the painful procedures and experience of pain would have an effect on how babies would process gentle touch." About 15 million babies around the world each year are born prematurely, before 37 weeks of pregnancy, according to the World Health Organization. In the United States, about one in 10 babies is born preterm, adding up to more than 500,000 annually. 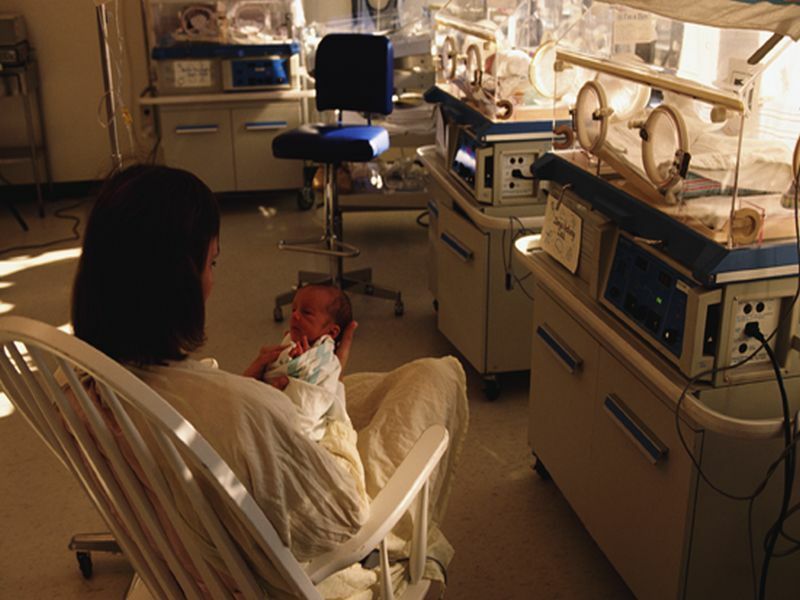 Many premature infants spend extended periods in the hospital neonatal intensive care unit, or NICU. In this setting, parents can't always be on hand to hold or stroke their infants, and babies face multiple medical procedures -- some painful. This study's participants included preterm infants born between 24 and 36 weeks of pregnancy, and full-term infants born between 38 and 42 weeks of pregnancy. Maitre and her colleagues recorded all positive experiences of touch, such as cuddling or breast-feeding. They also placed a soft net on the babies' heads that measured brain response to a puff of air that was meant to mimic a light touch. The brains of preemies were more likely than their full-term peers to record reduced brain response to gentle touch. But, their response was stronger when NICU babies spent more time in gentle contact with parents or clinicians, the researchers found. Additionally, the more preterm a baby was, the more likely their brain response to light touch would be weakened at the time of hospital discharge, the findings showed. "One of the really sad things we noticed is ... that most babies in our study didn't have a ton of that supportive touch, and some had none," said Maitre. "They have to depend on nursing care and the gentle touch of nurses entirely before they go home. There are so many challenges to parents spending time in the NICU and doing skin-to-skin care, breast-feeding and supportive touch," Maitre explained. "Obviously," she added, "there's no substitute for breast-feeding and skin-to-skin care by parents. But send a grandma or another caregiver if you can't be there, because every bit of that supportive touch is going to matter." Dr. Deborah Campbell is director of the neonatology division at Children's Hospital of Montefiore Medical Center in New York City. She praised the new study, saying it adds to a growing body of research indicating painful experiences in the early newborn period have both short-term and lasting brain effects. "This is actually an emerging body of information that's helping us to understand the impact of various experiences preterm infants have, in terms of brain connections ... that happen as infants develop, and some experiences that can alter those connections," said Campbell, who wasn't involved in the study. Maitre said she hopes her research will support "a really rigorous look at what interventions we currently use to mitigate pain" in NICU babies. Opioid painkillers and sugar water are typically used currently, she said. "Secondly, let's design some interventions that don't necessarily involve 24-hour parent presence," Maitre added, "but build a bond between parent and infant, and provide supportive touch." The study was published online March 16 in the journal Current Biology.